As a brief addition, the Raman spectrum presented on the spectroscopyNOW website does not provide quite the resolution of the original. In the interest of laying all doubts aside, a larger version of the same image is provided below. 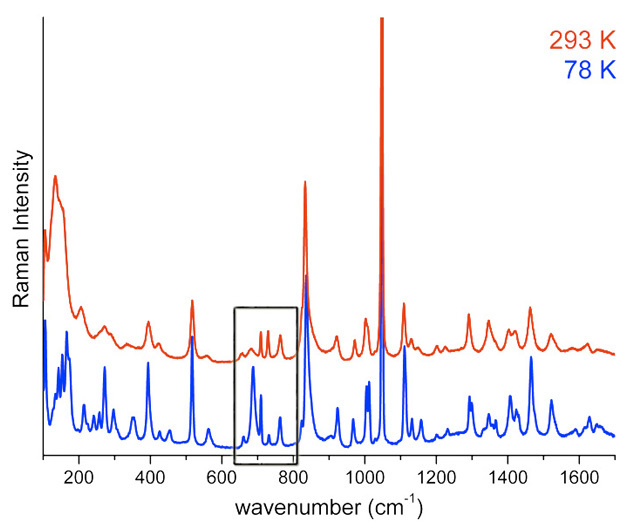 The 293 K and 78 K Raman spectra of LAAN showing temperature-dependent peak changes (black box). Even if there turns out to be no ferroelectric transition in LAAN, it could still represent an unusual and intriguing structure in which both a neutral and zwitterionic L-alanine amino acid exist in the same crystal cell together with crystalline nitric acid. Such a material might help to improve the computational structural models, improve our understanding of the spectra of related materials and perhaps offer clues to designing a next-generation material that does have the elusive ferroelectric properties.